Information Sessions at the GW School of Business (GWSB) are unique events which provide an opportunity to learn more about our degree programs, study abroad experiences, curriculum, alumni events, professional development opportunities and more. You'll have a chance to speak directly with our faculty and staff and get answers to the questions that matter most to you. Many Info Sessions focus on the admissions requirements for graduate programs, so they can be a great place to start if you have specific questions related to your career path and how a degree or certificate from the GW School of Business can help you achieve success in your chosen field. Expand the boxes below to register for on-campus or online info sessions as well as sessions in your home town. If no sessions appear in a tab, none are currently scheduled. 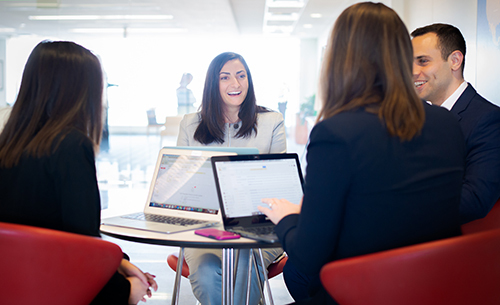 We invite you to join us at the GW School of Business (GWSB) on April 27 from 9:00 a.m. – 12:30 p.m. for an on-campus information session to learn more about our MBA and Specialized Masters degree programs.